Disney's Maleficient opens today. The elegantly dark villain of Sleeping Beauty takes center stage in one of my most anticipated movies this summer. 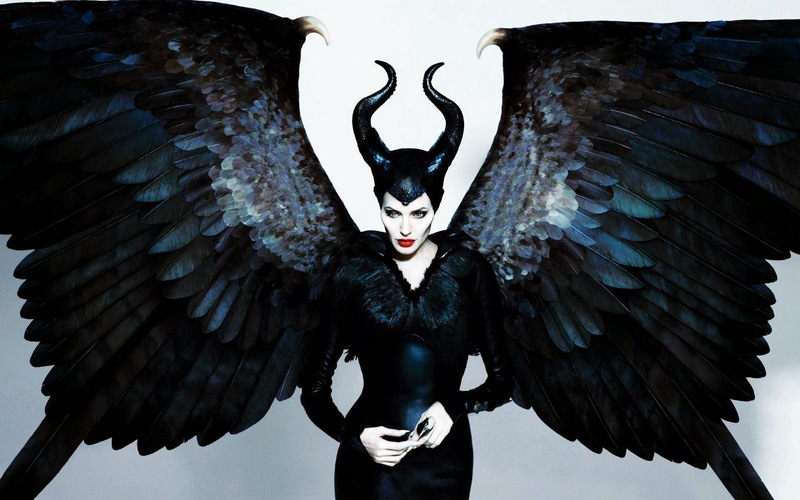 I started geeking out when I first saw Angelina Jolie's Maleficient costume in the poster. The twisted shiny leather horns with stingray cap, the deep red lipstick, the sharp edged cheek implants... Yes. Spanish costume designer Manuel Albarran is known for his fashion looks specializing in leather and corsetry. He collaborated with legendary Hollywood costumer Sandy Powell, milliner Justin Smith and Rob Goodwin on some of the pieces as well. Creature effects and make-up legend Rick Baker created the cheek implants. Angelina Jolie was inspired by Lady Gaga's look from a few years back and they echo the extreme look of the original animated version. Maleficient's signature horns made have evolved from 15th century headpieces called horned hennins according to artist Claire Hummel. She did a series of illustrations depicting popular Disney characters in historically accurate garb based on their story's time period. She dated Sleeping Beauty's character around 1480 based on the houppelandes and the horned hennins were also a big trend earlier in the century. The pieces in the film involved a lot of structure. Manuel Albarran constructed metal bases wrapped in leather for the horns. The dramatic wings and collar required layers and layers of hand dyed feathers carefully attached to a bone spine. So how does a civilian get this look? There are basic costumes inspired by the Disney at costume shops and Ebay. More involved hand-made costumes can be found by designers on Etsy. HSN is launching their Maleficient collection this week. Their top designers have created collections inspired by the movie. Josie Natori was inspired by the forest and flora of Sleeping Beauty, designing lingerie with a beautiful botanical print. 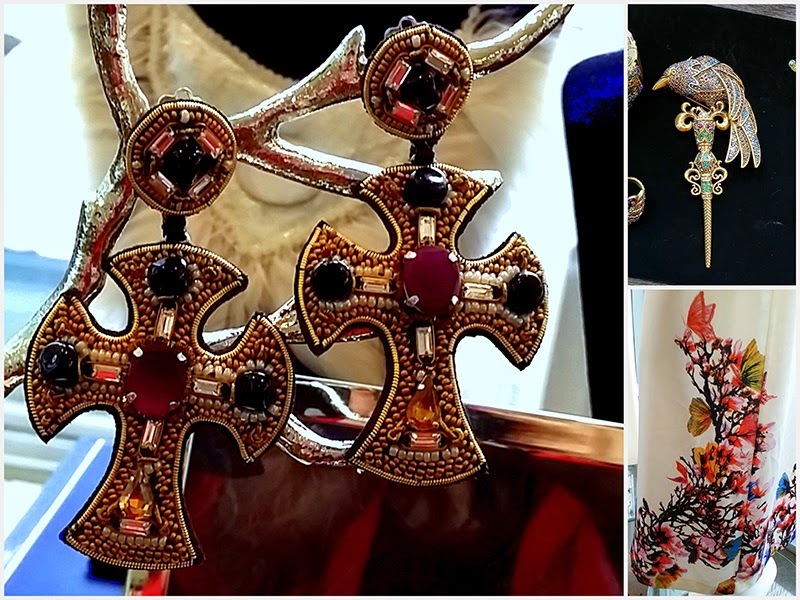 Jewelry designers Ranjana Khan and Heidi Daus made intricate jeweled pieces with a darker edge inspired by the motifs in the film. Of course, I was drooling with anticipation for the launch of the M.A.C. 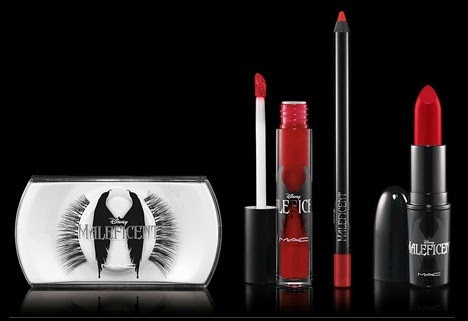 Cosmetic's Maleficient collection. If you are looking for the dramatic eyelashes and deep red lipstick, this is where you find it. Whether you are a sleeping beauty or mistress of the dark, it's nice to know you have plenty of style choices for a fairy tale ending.